A Stop limit is a conditional trade to buy and sell crypto that acts to stop any loss over a set limit price. A Buy/Sell limit order is triggered once the price of a selected coin reaches specified Stop Price (this price needs to be defined by you). The Stop limit feature is helpful in preventing excessive losses and is a secure way to automate orders without constantly needing to watch the market. Quantity: Amount(fiat) or quantity(crypto) you would like to buy/sell at the limit price. Stop Price: When the last traded price reaches a given stop price, your stop order(buy/sell) will be triggered at that specified price. 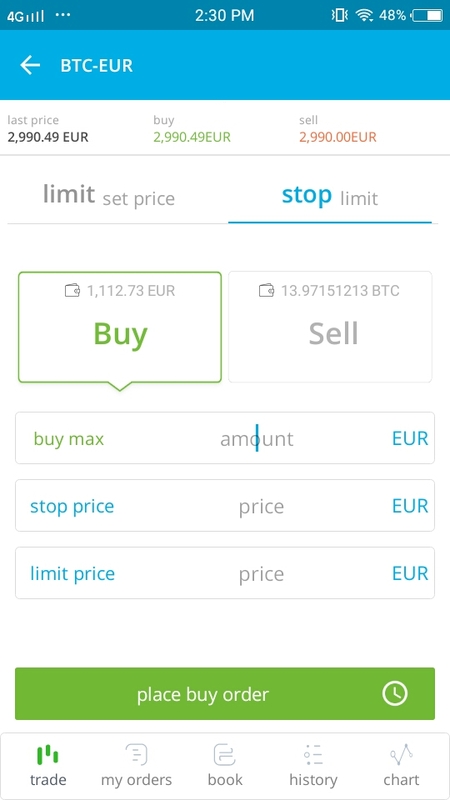 Limit Price: The Price at which the stop limit order (buy/sell) is placed in the order book. Example: Let's say you have bought 1 BTC at €3500. You notice a price drop and you may want to exit your position at nothing less than €3400 EUR to prevent further loss. You will need to place a sell stop limit order with the limit price at €3400 and a stop price of €3405. Once the price reaches €3405, it will automatically trigger your BTC sell order at €3400. A Buy stop limit order is triggered when the last traded price reaches or exceeds the stop price of the order. For a buy stop limit order, the limit price must be greater than or equal to stop price. A Sell stop limit order is triggered when the last traded price reaches or falls below the stop price of the order. For a sell stop limit order, stop price must be less than the last traded price. A Stop limit order will revert to a normal limit order once triggered. Select the cryptocurrency you wish to trade in. Below the price ticker, tap on Stop Limit. Set the limits as per choice. Complete your trade details and Execute.